The SOMMER TI is an integrated lightweight walk-in body for transporter chassis in the 3.5 to 7.0 ton class. 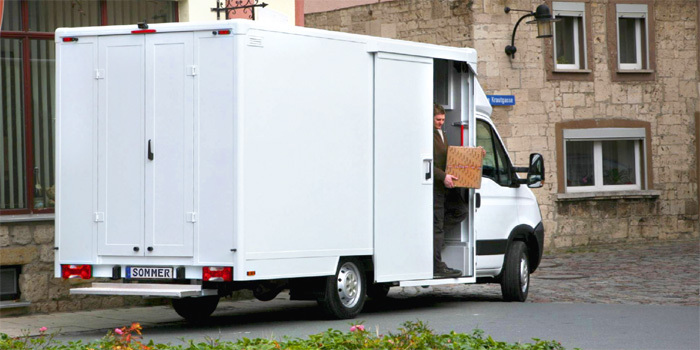 It has a large loading area, driver‘s cab extension and direct access to the loading area with lockable sliding door. The body is available either in a double-walled lightweight panel or riveted full-aluminium version. Both versions are extremely stable with very low tare weight. The advantage for you: long service life, high payload. We equip the loading area with an innovative shelving system with integrated cargo control. The shelves are also available in a folding design, providing space for bulky goods. Automatic locking side and rear doors are an additional safety feature. The large sliding partition wall and the 900-mm-wide gangway in the loading area facilitate fast access to the cargo, plus fast entries and exits. The aluminium shelves are available in a folding design, which creates additional space for large goods. The shelves are designed for a load capacity of 200 kg. A non-slip, broad step at the rear ensures safe loading and unloading. The special attachment prevents damage to the vehicle frame in the event of an impact. Perfect cargo control: Cargo can be secured quickly and effectively with the right straps thanks to the integrated lashing rails on the shelves and the fl oor. The locking system locks the loading area doors automatically to protect the loading area. The locks are released via the vehicle‘s central locking system or from inside with large switches.